I have a new to me brand to share with you today. This brand is Superficially Colorful made by Jin all the way in Israel. Jin came to Cosmoprof in Vegas last month and provided all of us with one of her polishes. This particular polish was exclusive to the Cosmoprof event, but I wanted to share it with you so you can get an idea of what prettiness she has to offer from her brand. Stay Classy Las Vegas is a cherry red with a golden holographic shimmer. Color: These is a saturated cherry red. The color is pigmented, and I love golden shimmer, especially the holographic kind. Formula: Excellent formula! This applied smoothly and evenly in 2 coats. 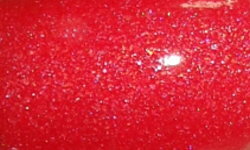 Price: This particular polish isn't available for purchase, but her polishes for sale are $9.00 each. Check out her shop! Overall: I love reds like this. I'm not one to tired of reds at all, and the golden holo shimmer is just icing on the cake. The formula was also impressive.